Don't overlook your front end when rebuilding your classic Chevy car; replace your old worn out bushings, ball joints and tie rod ends. CPP's rubber front end kits make it possible to achieve better than new performance for a modest price. Two kits are available for you to choose from. All kits include: upper and lower ball joints, outer tie rod ends, control arm bushings, and strut rod bushings. End links sold separately. 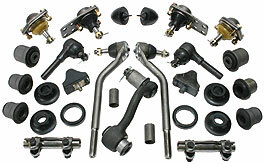 Complete kits also include: inner tie rod ends, adjusting sleeves and idler arm.